In advance of United's first-quarter 2019 earnings release, CEO Oscar Munoz recorded a message thanking United's 93,000 employees. "Thanks to your incredible dedication and teamwork, we came strong right out of the gate in 2019," said Oscar. He also touted United's growth strategy and focus on improving the customer experience. "We gave our customers so many new and exciting reasons to choose to fly United. Live television is now free for every passenger on more than 200 United planes. We changed the game for regional flying with the introduction of the brand new CRJ 550 aircraft. And, of all the new routes we're planning to launch, I know we're all looking forward to United returning to Africa with service from New York/Newark to Cape Town…. Our momentum is only starting to build, and our future is brighter than ever," Oscar told employees. We appreciate all the feedback we've been receiving from California customers like you — it led to an amazing 2018 and has helped as we prepare for what's next. In 2018, we announced our largest ever international network expansion from San Francisco — we'll offer flights to Melbourne, New Delhi, Seoul and more this year. We're also adding flights between Los Angeles and more than 15 U.S. cities that aren't served by any other airline. A great travel experience starts with a great airport experience. We now have beautiful United Polaris® lounges in Los Angeles and San Francisco — both spaces have luxurious shower suites, private daybeds, and California-inspired artwork, food and beverages. And last year, we began a partnership with The Private Suite to offer private security screening, an intimate lounge and more to select travelers at LAX. United is the only airline with this partnership. At the Global Climate Action Summit in San Francisco this past September, we became the first U.S. airline to commit to reducing our greenhouse gas emissions by 50%. As part of that commitment, we flew from San Francisco to Zurich with a blend of biofuel and conventional jet fuel — the longest-ever transatlantic flight with that biofuel volume. We're also investing more than $30 million in Fulcrum BioEnergy, a California-based producer of sustainable fuel. We're committed to updating you in the ways you want to hear from us. When there's weather in California that affects your flight, we're keeping you informed with real-time info through our United app and beyond. We can't wait to hear more from you in 2019 — and to give you more as the year goes on. This week on the Smart Women, Smart Power Podcast, Beverly Kirk is joined by Linda Jojo, Executive Vice President for Technology and Chief Digital Officer at United Airlines for a conversation on the transformation of technology in the airline industry and more on security in the digital age. As a proud resident of the New Jersey and New York area for the past thirty years, I know firsthand how vitally important Newark Liberty International Airport is to the success of the communities and families throughout the state – the jobs it creates, the economic activity it generates and the businesses and people it connects to markets around the globe. We are one of the top ten employers in the state, with 14,000 employees as part of the United family and are Newark Airport's largest airline, together with our Star Alliance partners, account for more than two-thirds of both total flights and passengers. It's obvious that keeping Newark competitive requires a competitive United Airlines. That's why we've invested more in Newark Airport than any other airline, making both our service and the airport better. We've committed $2 billion in unsubsidized airport investments since 2000 and nearly $400 million over the past two years alone. Not only are we giving back at the airport, but we are also supporting the communities we call home. This July, we announced two new partnership grants totaling $1 million for the cities of Newark and Elizabeth supporting the Community Foodbank of New Jersey and Urban League of Essex County. These grants will greatly expand opportunities in each city, helping hundreds of young people and adults on the path to meaningful carriers and economic mobility. This commitment complements our longstanding support across New Jersey, from schools to local shelters, to vital community anchors such as the Newark Museum, the Liberty Science Center and New Jersey Performing Arts Center. We view New Jersey's success and United's as inextricably linked, which is why the negative tone that's been adopted recently has been extremely disappointing. I am determined to get us back on the right track. Case in point: the discussion regarding our recent decision to transition some of our operations from ABM Aviation to United Ground Express (UGE) has been unfair. Let me clarify a few things. The current contract held by ABM was up for renewal and we began a competitive bidding process in order to improve our customers' experience at Newark Airport. After our review, we determined that UGE was the right vendor to achieve this for United's passengers and in turn, our overall operation at Newark airport. To date, we've hosted seven job fairs and received hundreds of applications, many from current talented ABM employees and, we expect our employment figures to remain where they were before the transition to UGE. These newly created jobs will be represented by IAM, one of our union partners. As a company we believe it's appropriate for the state to determine the minimum wage and as a good corporate citizen we continue to observe and comply with all applicable federal, state and local laws and regulations. We remain committed to treating all of our employees fairly, providing them with competitive compensation and benefit packages which feature a progression wage scale, paid time off (PTO), double-time holiday pay and company subsidized health care plan for full-time employees. Under UGE, employees also receive United flight benefits, which is a notable and unique addition to our employees' overall compensation. United is important to the region. Without United's continuing investment in the airport, not only would jobs be lost, but also it would be a major blow to the state's economy and to the New Jersey taxpayer. We pay local taxes; the Corporate Business Tax (which was increased earlier this session); and the jet fuel tax and in addition, we pay more than $400 million a year in rates, charges and fees to the Port Authority to fund operations and infrastructure development at Newark airport. All told, United pays our fair share and creates nearly $16 billion in economic output in New Jersey and we're very proud to be doing our part to drive the New Jersey economy. The stakes are too high for this issue to be turned into a political football and subject to overheated, misleading rhetoric. We care deeply about our employees, our customers and our state and take our responsibilities as a good corporate citizen very seriously. We're determined to remain competitive so we can continue offering the service and standards our customers and this community deserve. United is proud to call Newark home, I hope you'll support our efforts to continue investing and growing in the great state of New Jersey. Here at United, the past few months have been extremely busy. As President of New York/New Jersey for United, I'm proud to share what we've been working on for you. Our United Polaris® lounge at Newark Airport opened this June, exclusively for travelers in first and business class on select international flights. Like our other United Polaris lounges, it offers rainfall shower suites, abundant workspaces and rest pods with daybeds — but you'll also enjoy local artwork and preflight dining with locally inspired flair. You can learn more in this special article about the United Polaris lounge. We've also opened a new pop-up United Club location near C93. This is in addition to our other pop-up club near Gate C124 and full-service locations in Terminals A and C. Both pop-up lounges offer beer and wine, as well as light snack options. We know lounge space is important and we'll continue to look for ways to enhance your experience. You can also take part in a unique culinary experience by visiting our new Global Bazaar in the C1 Concourse of Terminal C. Designed in collaboration with OTG — a United partner that shares our commitment to working with artisanal suppliers who give back to their communities — this new area offers international dining and gifts inspired by global travels and frequently rotates new products. OTG has also helped us open an array of other restaurants in Terminal C.
We're also working with our partners to transform New York LaGuardia's Terminal B. This state-of-the-art facility will offer innovative new dining concepts, unique retail shopping options and more. Terminal B's new parking lot opened recently with a new indoor pickup area to make ride-sharing and coordinating car service more convenient. In September, we'll offer more flights for college football with added service to Madison, WI; Omaha, NE; South Bend, IN; and more. And in October, we'll have an expanded schedule of flights to noteworthy cities such as Nashville, TN; New Orleans, LA; Orlando, FL; and beyond. This winter, we'll continue to offer nonstop service to key ski destinations. If you prefer a warmer getaway, you can take advantage of our new, seasonal flights operating nonstop between New York/Newark and Palm Springs, CA, starting December 19. And next summer, we'll begin flying nonstop seasonal service to Prague, Czech Republic, and Naples, Italy. Despite the severe weather we've battled in the East Coast, we're committed to getting you to your chosen destination as quickly and smoothly as possible. During summer thunderstorms, the Federal Aviation Administration may prevent planes from taking off and landing, or restrict the number of planes that can take off or land. In these instances, we may need to delay or cancel a flight to meet our high safety standards. 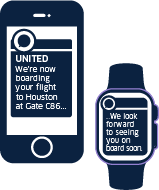 If that does occur, our automated systems will try to confirm you on the next available United flight. If you provided contact information during check-in, you'll receive an email or text message with your updated itinerary. You can also check your itinerary online, on the app or by speaking to an airport representative. United has been working closely with local leaders to identify and build deep and meaningful partnerships that address the area's most critical needs. As part of this effort, we've committed $2 million to New York and New Jersey organizations that we are very proud to support: the Community FoodBank of New Jersey, Urban League of Essex County and YearUp New York. Our grants will help these organizations connect teens and young adults with training opportunities through workforce redevelopment programs focusing on creating career pipelines in technology, culinary arts and more. It's a great opportunity for more people in our communities to achieve upward economic mobility and gain access to meaningful careers. So, whether you're excited about your travel plans in the coming months or simply care about helping others make moves in their personal lives, I look forward to the ways United can serve you and your community better. You — our customer — are our top priority and I want to thank you for your loyalty. Being new to the airline industry, I've spent the past several months listening and learning from customers like you whose candor has been invaluable as we continuously focus on refining your United experience. Enjoy the fall and please feel free to share your thoughts with me at JillKaplan@united.com. *Routes are subject to government approval and subject to change. As parts of Oregon and California continue to battle blazing wildfires that have already consumed thousands of acres of land, we stepped up to help and flew a group of Australian firefighters to Boise, Idaho, over the weekend. We created an extra section to fly a group of firefighters from all over Australia to Los Angeles International Airport, where they departed on a flight to Boise, Idaho on August 4. Australia/New Zealand Contingent Field Liaison Officer Barry James explained that firefighters were selected to come help based on their qualifications, and they're all proud to support their fellow firefighters in the United States. "We're flying to Boise for a couple of days of training and then we'll be splitting up. Some of us are going to Northern California and the rest are going to Oregon for a six-week deployment," explained Officer James, who flew United for the first time, but said it won't be his last. "It was an awesome, awesome experience; it was really hospitable," he added. Our Los Angeles based employees and crews made sure the firefighters felt their appreciation by giving them a special welcoming message in the gate area, where they thanked them for their hard work. "It was such an incredible honor for us at LAX to meet and fly these men and women, who are sacrificing their time and putting their lives on the line to help us battle the wildfire devastation in this part of the country," said LAX Station Operations Control Manager Maggie Ronan. "The crew in general was just outstanding. They were all so honored to fly this group and felt it was amazing that United built the extra section for their journey. There was a very special energy felt on the flight as we closed up to send them off to BOI." We're teaming up with leading disaster relief organizations to provide aid to those impacted by the California wildfires. We will match up to $50,000 in total donations made to our charitable partners, Airlink, American Red Cross, Americares, North Coast Opportunities and Shasta Regional Community Foundation. For more information and to make a donation California Wildfire relief efforts, visit our CrowdRise fundraising campaign.